Bottom Line: When poor corporate governance occurs as a result of or contrary to proxy advisor firm recommendations, shareholder value is destroyed and investors are negatively affected. But the shockwaves are felt most acutely by seniors on fixed incomes in the form lost value in institutional investments and pension funds. The proxy advisor industry is essentially a duopoly, with Institutional Shareholder Services (ISS) and Glass Lewis exerting control over approximately 97 percent of the market. Both work by providing recommendations to shareholders on whether to vote “for” or “against” proposals based on certain criteria, and both advisors provide low-cost proxy advice to thousands of investors on a huge number of company meetings annually. Evaluating thousands of proxy votes annually has engendered a “one-size-fits-all” approach to corporate governance while also resulting in erroneous recommendations being issued to institutional investors, both of which have the potential to harm returns for all investors, particularly seniors. A review of nearly 140 supplemental proxy filings, which serve as a company’s main recourse to respond to a faulty recommendation, found 139 significant problems in recommendations, ranging from analytical and factual errors to serious disputes. Fund managers often vote entirely based on the proxy advisors’ recommendations, in a process called “robo-voting.” The favorable regulatory framework under which the SEC has allowed proxy advisors to operate has not only led to a situation where investors blindly follow poor recommendations; it has the ancillary impact of disincentivizing institutional shareholders from carrying out their own independent research. In addition, the lack of transparency with which these firms operate continues to garner significant scrutiny. For instance, ISS has come under the microscope for setting its voting policy through a closed-door process and providing consulting services to the same public companies it analyzes for voting recommendations. A review of ISS and Glass Lewis voting recommendations on proposals at several companies shows numerous failures to identify emerging corporate governance issues, which resulted in consequential destruction of shareholder value. 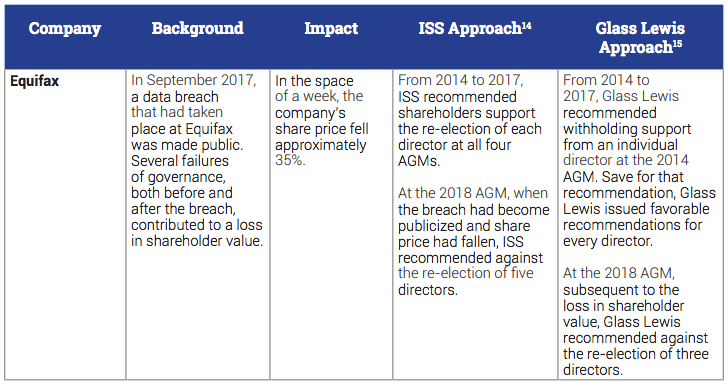 The corporate governance failings at Equifax, Wells Fargo, Tesco and Carillion have been well documented since they occurred. Ineffective corporate governance, the absence of strong oversight, and weak corporate cultures were among the primary reasons cited for the significant loss of value at each company, despite proxy advisor recommendations failing to alert clients to those issues. • A review of ISS and Glass Lewis voting recommendations on proposals at several companies shows numerous failures to identify emerging corporate governance issues, which resulted in consequential destruction of shareholder value. • Ineffective corporate governance, the absence of strong oversight, and weak corporate cultures were among the primary reasons cited for the significant loss of value at each company, despite proxy advisor recommendations failing to alert clients to those issues. • When poor governance occurs as a result of or contrary to proxy advisor firm recommendations, shareholder value is destroyed and investors – especially seniors -- are negatively affected.